Panic is a YA novel set in a small town in New York State. A coming-of-age story, the novel centers itself around a group of high school seniors all involved in a town ritual known as Panic. 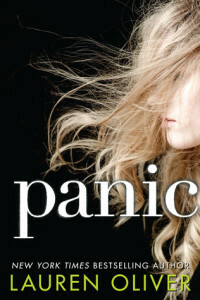 As our narrator – Heather – explains, Panic is one of those things that would never exist in a town that had anything going for it. It is, indeed, born out of the boredom of teenagers in towns where there is no hope for a future except to get out of it and only scarce resources with which to accomplish that. We’re told there was a paper mill, but it shut down. Few kids go to college, so instead, they hope to win Panic their senior year. What is Panic? It’s a death defying tournament run by mysterious judges and financed by an elaborate and mandatory payment system along with an under-the-table betting apparatus. Every year, seniors at Carp High School enter the Panic by jumping off a quarry cliff into a lake. Heather wasn’t planning on doing it, but the thought of the money – sometimes upwards of $60k – was enough to make her potentially put her life at risk. As the challenges escalate – and it’s important to understand that Panic is illegal and the cops do not like the game, but the town still plays it anyway – Heather and the other characters must face the grim realities surrounding them – both if they loose Panic and if they win. With so many YA novels about middle or upper class kids, it’s always a bit refreshing to read one set in a different setting. There is no way out for these kids, there is no support system, there is no tangible and clear next step. The few breaths of fresh air in terms of caring and responsible adults can only do so much. This novel broke me in a way – I felt their aching despair. I felt the decisions that Heather in particular had to make and I wanted to go find her and help her because Panic was not even the most dangerous thing that poor girl faced. I read this slowly with a few cups of coffee – a warming drink for a chilling novel. Carp, NY is a fictional small town. One author offers tips here on how to create the best small towns. Homelessness is a large problem facing a few of the characters. Homeless teens are not as uncommon in the U.S. as you may think. Here’s a fact sheet on the problem. I think this would totally be part of Panic if Carp had trains. I got my copy of this book from my local library. Long live libraries!